San Jose Fire Department is investigating a possibly hazardous material incident at 75 E. Trimble. 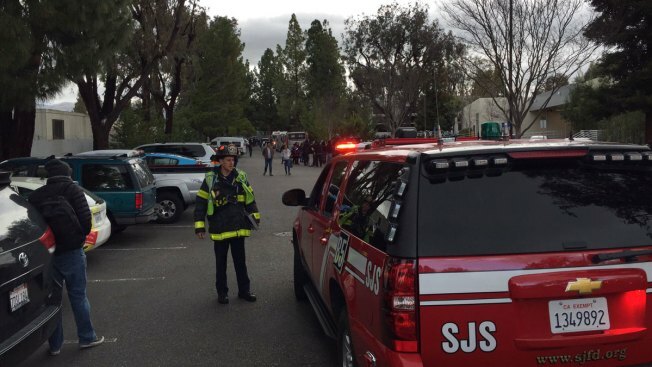 San Jose Fire Department responded to a possible hazardous material incident Tuesday morning but after searching a North San Jose building, firefighters determined there were no threats to the public. Residents were asked to avoid the area at 75 E Trimble Rd. and people were evacuated as firefighters look into what they said was an "unknown" hazardous material incident. Hundreds were evacuated after some employees complained of burning eyes, throats and coughing. Firefighters in protective clothing searched the building but found nothing to be hazardous, according to the fire department. Firefighters allowed employees to go back inside and no one was taken to the hospital. The building where authorities said the incident occurred is one of Google's coorporate offices in North San Jose.